The cover image of Freedom on the Net 2015 released by Freedom House. The Gambia has been ranked second worst out of 12 countries in Sub-Saharan Africa included in a study on Internet freedom. In its 2015 annual “Freedom on the Net” report, Freedom House, a US-based organization promoting freedom and democracy around the world, scored up to 65 countries globally on real-world rights and freedoms enjoyed by individuals within each country. The Freedom on the Net report aims to measure each country’s level of internet and digital media freedom based on a set of methodology hugely grounded on international instruments on freedom of expression. Violations of User Rights tackles surveillance, privacy, and repercussions for online speech and activities, such as imprisonment, extralegal harassment, or cyberattacks. The results are compiled from information gathered from the organisation's researchers who include in-country bloggers, academics, journalists, and technology experts. 16.0% of the 1.9 million people in Gambia have access to the Internet. However, the state-owned telecom company, Gambia Telecommunications Company Limited (Gamtel), owns the fiber-optic cable that connects the country to the international internet. In 2013, Gambia passed a new law that clamps down on critiquing or lampooning government officials on the Internet. The Information Communication (amendment) Act 2013 seeks to punish “instigating violence against the government or public officials”, and also targets individuals who “caricature or make derogatory statements against officials”. In March, 2913 Gambian netizens took to social media to ridicule President Jammeh and the pro-government newspaper for claiming that a letter by the US President Barack Obama sent to President Yahya Jammeh is an endorsement of his rule. While the popular Voice over Internet Protocol (VoIP) platform Viber was unblocked in July 2014, dozens of opposition and news websites remained blocked. Anecdotal reports indicated an increasing trend of politically sensitive content “disappearing” from the internet due to intimidation from government authorities. Digital activism led to the release of an activist and blogger, who was detained without charges for his work with the survey research firm, Gallup. In July 2014, a supporter of the main opposition party was prosecuted and fined US$1,250 for using Skype to send live coverage of an opposition political rally to the Freedom Newspaper online outlet based abroad. A former online journalist was arrested in August 2014 on accusations of sending sensitive information to “enemies” of the government based abroad. Tortured while in detention, he was released without charges and subsequently fled the country. Extralegal detention and harassment led at least two other online journalists to flee the country in exile. President Yahya Jammeh who has been in power since 1994, the reports notes, has been censoring the Internet in the country since 2006. The country has received a total score of 65, 100 being the worst. 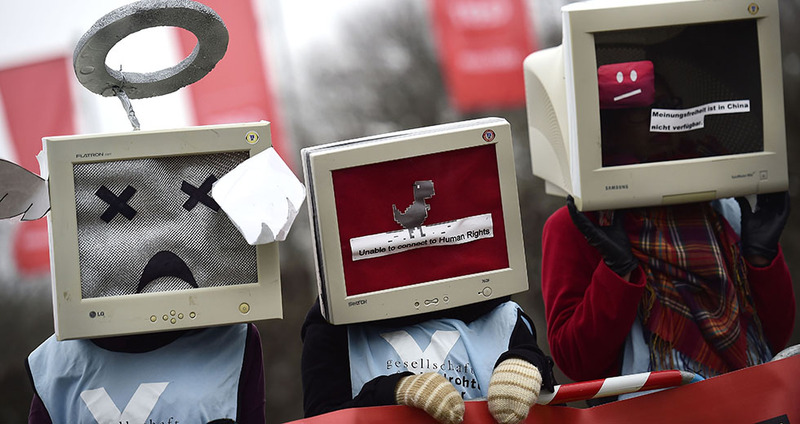 It reveals that: “More governments are now pressuring companies and individuals to remove content, as opposed to simply blocking.” China is singled out as the year’s worst abuser of internet freedom as President Xi Jinping made “cyber sovereignty” one of the priorities of his tenure as leader of the Chinese Communist Party, which has resulted into internet users facing crackdowns on “rumors,” greater enforcement of rules against anonymity, and disruptions to the circumvention tools that are commonly used to bypass censorship. But China is not alone in this. Syria and Iran were the second- and third-worst performers, respectively. In the Sub-Saharan Africa, Ethiopia tops the region with a total score of 82 while taking up 4th position globally. The index aims to capture the entire “enabling envi-ronment” for internet freedom within each country through a set of 21 methodology questions, divided into three subcategories, which are intended to highlight the vast array of relevant issues. The report concludes that in many ways, the past year was one of consolidation and adaptation of internet restrictions rather than dramatic new declines. Governments that had already greatly expanded their arsenal of tools for controlling the online sphere—by disrupting ICT networks, blocking and filtering content, and conducting invasive surveillance—are now strengthening their application of these methods. As blocking has become less effective, more governments have shifted to censoring content through removal requests or more forceful, coercive tactics. And as savvy internet users increasingly turn to encryption and anonymity tools to protect their rights, government officials across the political spectrum are seeking to undermine these obstacles to surveillance, potentially making the internet less secure for everyone.